Foodservice, good customer care and even expansion are among independent natural products stores' plans as Amazon makes its mark on Whole Foods Market. Get a coast-to-coast look at what's happening and what leaders are thinking. Now that independent natural foods retailers have had some time to let the Amazon-Whole Foods Market announcement settle, they are starting to think ahead to how they may adjust their plans in response. No one admitted to any thoughts of slowing plans for expansion, and at least a few major players are forging ahead with bold growth plans already in place. As for how the merger will change dynamics within the marketplace, everyone seems to have their own concerns. We checked in with a few independent natural grocers to hear how they envision their path forward. MOM’s Organic Market has one new store planned and two remodels big enough that Lisa de Lima, VP of grocery, said MOM's considers them new stores: one 8,000-square-foot store is going to 18,000, and a 10,000-square-foot store is expanding to 16,000. The purpose is not only to physically expand but to upgrade and introduce two new concepts for the retailer. De Lima couldn’t disclose what those concepts are but gave this hint: "Currently we don’t do as much with the periphery of the store and concentrate on ‘center store;’ these new concepts will widen our offering on the periphery of the store." Nelson said he’s not losing sleep over the Whole Foods deal, but the two concerns he did voice are over the supplements and body care categories—because Amazon has such a simple, efficient ordering and delivery system that could have impacts on the store—and, perhaps more worryingly, potential impacts on the supply chain in general three to five years down the road. “I’m more concerned about the future of the supply chain than I am necessarily about the competition,” he said. 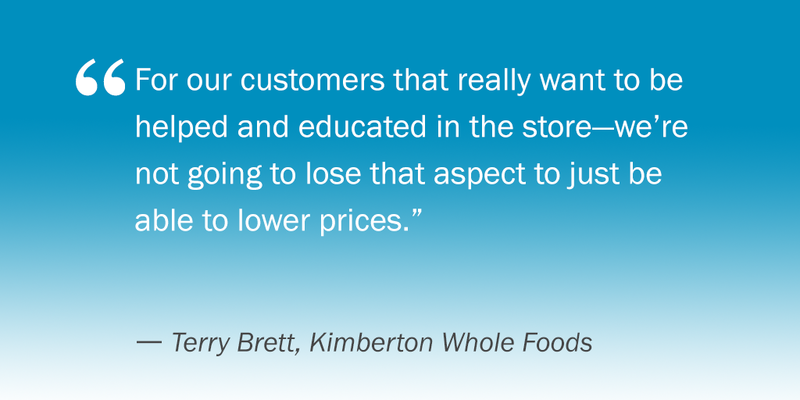 Kimberton Whole Foods is also sticking to its growth plans, with a new store opening in February and expansion of an existing store to take on its new, larger format. Past stores have been between about 3,000 and 8,000 square feet in size, and the new ones will be around 15,000. “So we’re upping the game,” Owner Terry Brett said. Kimberton is also growing its prepared foods sections with hot and cold bars, fresh sushi, baked goods and a full cheese wall with more sophisticated cheese offerings.